Perk up your space with this contemporary occasional table collection in a rich cappuccino finish. Modern design and unique styling make each piece a welcome addition to existing decor, while the round shapes repeated throughout the collection make furnishings small spaces a simple and effortless task. The sleek, rounded curves of the glass tops are echoed in the frames, from legs that bow out from the base to a chic wooden circlet that binds them together. Constructed from a poplar mix and bathed in a deep brown finish that practically cries contemporary decor, this three piece round table set is a must for your well designed modern home. 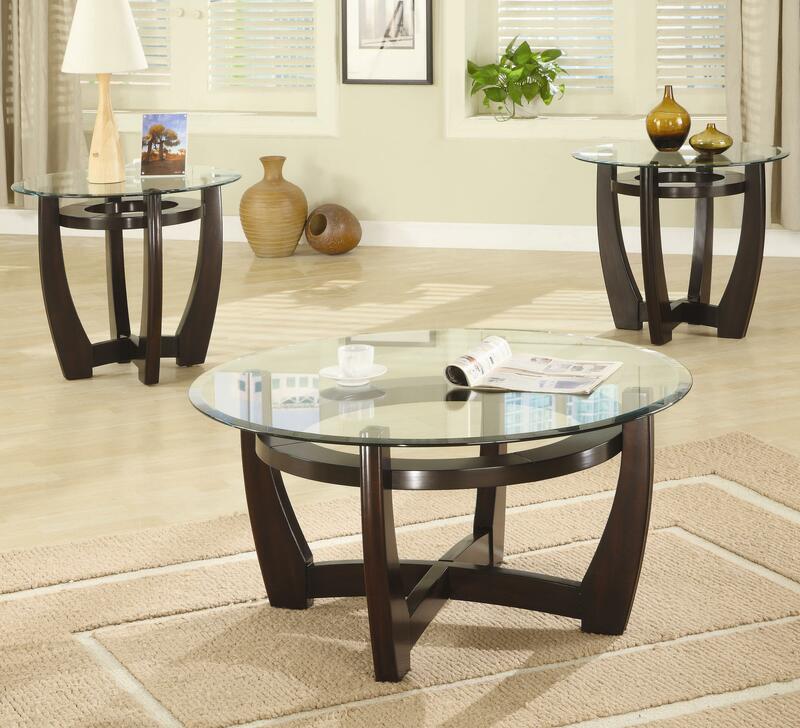 The Occasional Table Sets Contemporary 3 Piece Occasional Table Set with Glass Tops by Coaster at Corner Furniture in the Bronx, Yonkers, Mount Vernon, White Plains, Manhattan, NYC, New York area. Product availability may vary. Contact us for the most current availability on this product. 700295B1 3 Piece Table Set Box 1 1 0" 0" 0"
The Occasional Table Sets collection is a great option if you are looking for furniture in the Bronx, Yonkers, Mount Vernon, White Plains, Manhattan, NYC, New York area. Browse other items in the Occasional Table Sets collection from Corner Furniture in the Bronx, Yonkers, Mount Vernon, White Plains, Manhattan, NYC, New York area.